Today was our one day trip of this vacation. We got up early and took the metro to the train station. It took a bit of work to find the right place to buy the tickets to Toledo, but we succeeded. We took a 10:20am rapid rail train which had us in Toledo in 1/2 an hour. We then took a local bus up the steep hill to the old city. First stop was the Museo de Santa Cruz, a free museum with several El Greco paintings. 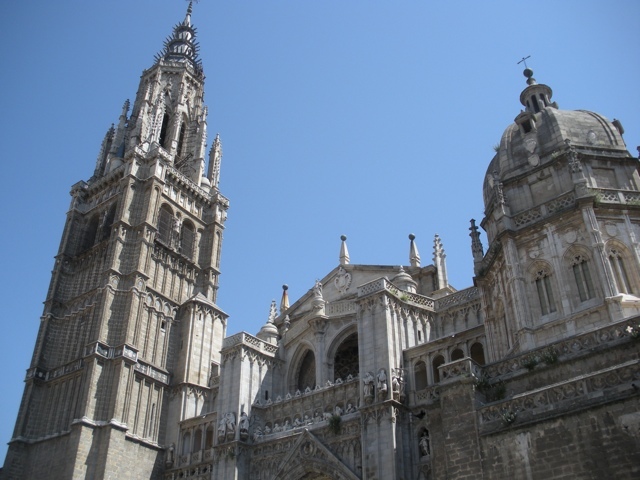 Next was the Catedral, pictured above. 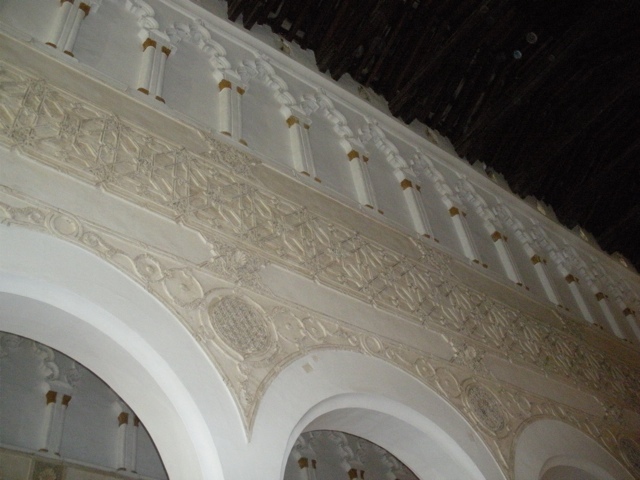 It was constructed between 1226-1493….that’s over 250 years! And it was finished a year after Columbus set sail? That is all just crazy. We weren’t able to take pictures inside, but it was magnificent. A lot of the interior was wood, some painted gold, so it was not gaudy but just beautiful. We then walked through the city, looking for a restaurant recommended by Frommer’s. La Perdiz was in the Jewish Barrio not far from the synagogues. It took us awhile to get service (a common experience here in Spain) and Ellen was getting ready to walk out. I stopped her because it was already 2pm and there were not that many dining options. I’m glad I did! I ordered scrambled eggs, deer meat and fries, which just seemed interesting. Ellen ordered manchigo risotto. My dish ended up being delicious! The eggs were more poached than scrambled, the deer meat was in pea-sized chunks, all served on top of the fries. The deer meat was tasty and chewy, a great flavor with the eggs. With apologies to Bambi, I’d eat it again. After lunch, we visited the one synagogue that was open today, Sinagoga de Santa Maria La Blanca. As you can tell by the name it was later (i.e. In the early 15th century) turned into a church. The interior is empty now, but they had Jewish artwork displayed inside. We then made our way back to the train station. These rapid rail trains had reserved seats, so we had no worries about a full train. When back in Madrid, we took the metro to the Salamanca District, as Ellen had not been to a Thomas Sabo store since February! She got 2 charms there. The Sabo shop was in a department store, so we went to the basement to get some fresh fruit, as Passover is starting and I’ll need to supplement my meals. It seemed too late (7:30pm) to head back to the hotel, so we took the Metro to Plaza Mayor, and started dinner at the too early time of 8pm! We had dinner in the square at Los Galayos, a family run restaurant not too touristy for its location. I had salmon in cider sauce, Ellen had veal. For dessert, I had lemon sorbet with champagne, which was served with a straw, and made for the best Slurpee ever! Ellen had chocolate cake. It took a long time to get the check, as it again seemed our waitress went on break after we had requested it. No matter, what’s the rush. So even with our “early” dinner, we didn’t finish until after 10pm, and not back to the hotel until 10:30. Tomorrow is a full day if museums and whatever else we can fit in. We’ve had a great time so far, and unfortunately, only a little time left. This entry was posted on Monday, April 18th, 2011 at 8:24 pm	and posted in Spain, Toledo. You can follow any responses to this entry through the RSS 2.0 feed. « Day 2: Ellen is relaxed!